Well done CNN! 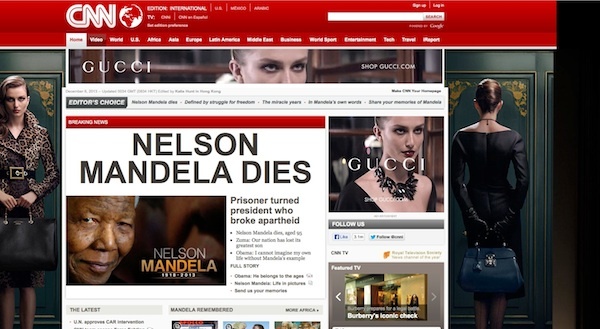 The international news service has framed the news of Nelson Mandela’s passing with high-gloss Gucci ads — a juxtaposition lacking the taste Gucci would like to be known for, and which is apparently alien to CNN. Another hideous resonance from this collision is the gap in wealth between black Africans and their former apartheid masters, and the wealth gap that exists between a great many African countries and the former colonial powers. Is it possible that any punter tuning in to grieve Mr Mandela will stop and think ‘Hmm, must get a new designer cardigan while I’m here’?